Found this awsome paper, Painted Fancy by Recollections. I just loved the colors. I pulled two more colors of cardstock that popped the colors in the print. I used MFT Blueprints 13, 16, and 20 to cut each piece out. I made a couple extra cuts to the calypso coral piece to make the tag top. I then used my MISTI and the MFT I Knead You stamp set and stamped the tag in versa mark and white embossed it. I added some aqua enamel dots. Last but not least a piece of lavender sheer was add behind the tag. 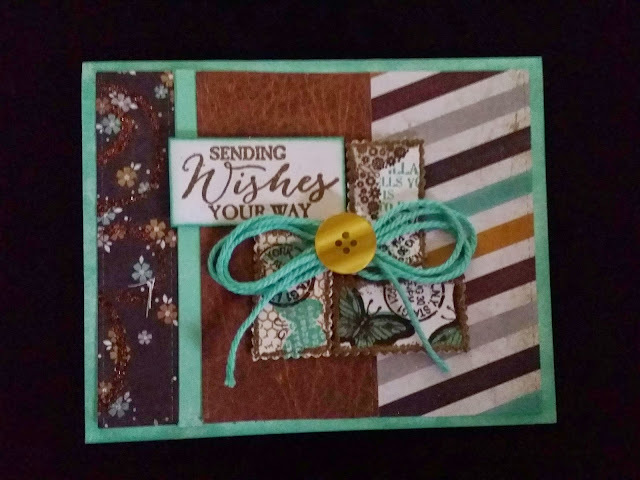 I had picked up the Free Spirit We R Memory Keepers paper pack and had to create with it. The colors are so beautiful. I started off creating the postage stamps using Stampin' Up Butterfly Basics stamp set stamped in coastal cabana, early expresso, and hello honey and embossed on the edges in gold. 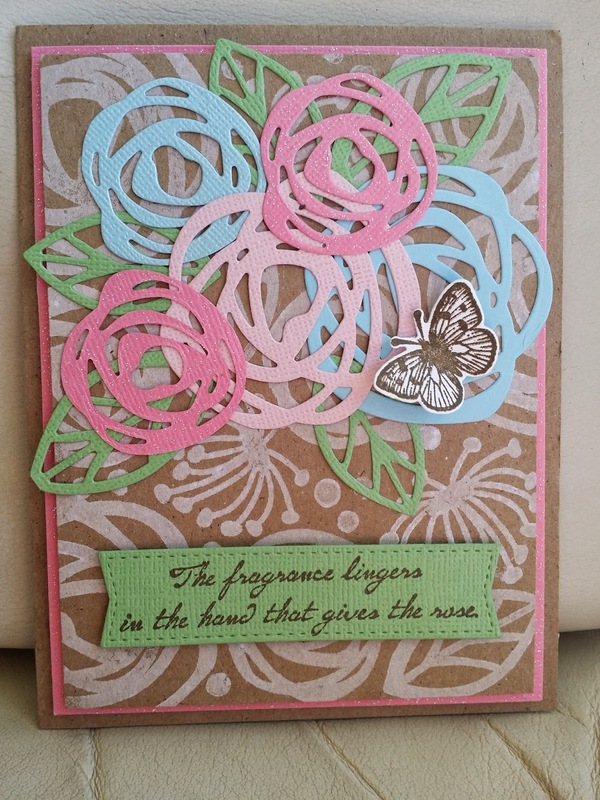 The sentiment which comes from Stampin' Up Butterfly Basics was also embossed in gold. The background piecing was cut with My Favorite Things Die-namics Blueprints 3. Stickles fine glitter in cinnamon was added to the background. I finished it up with wink of stella, a piece of coastal cabana bakers twine and a hello honey button. This was so much fun. 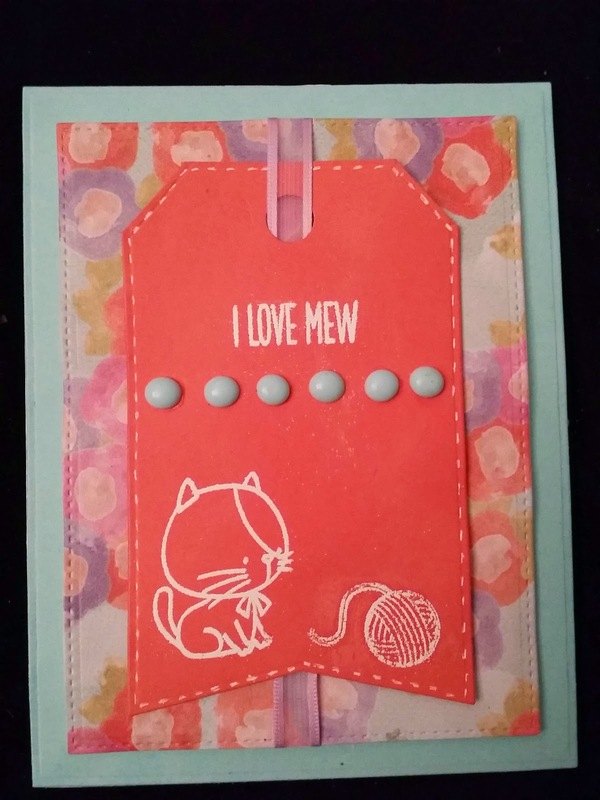 I started with the Simon Says Stamp April card kit as my inspiration. needed a background paper to bring some fun into my card and couldn't find anything that went with the colors, so I created my own. I used inkadinkado ' s Circle and dots set and stamped sss orange peel, mint, and doll pink on Neenah white cardstock. It needed some pizzazz and the gold embossing did the trick. After gold embossing the sentiment on vellum which is from Simon Says Stamps Big Birthday, I thought it would add a little something extra if I curved the It's Your Birthday from the same set in the top left corner. I really like the results. 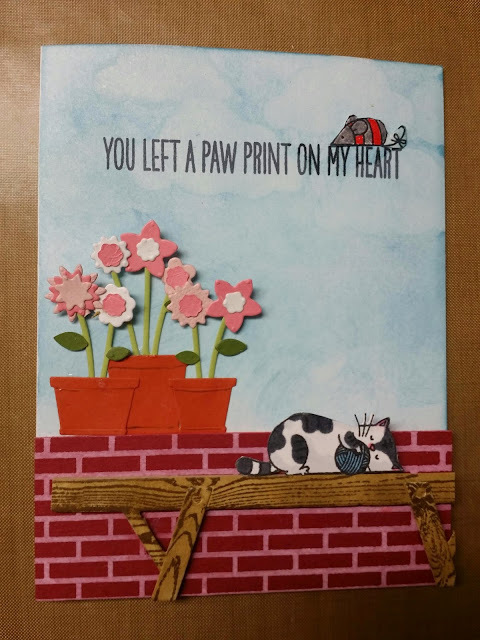 When I looked at all the goodies I received from My Favorite Things I knew I had to create a brick wall with the Small Brick background stamp and put a cute little kitty on it from the I Knead You stamp set. The first thing I did was to stamp white pigment ink on red cardstock for the brick wall. Then I stamped the cat in memento tuxedo black and colored it with copics. The sky was created by blending Tim Holtz Broken China distress ink on to white card stock then I cut the Cloud Cover Die-namic out of card stock and used it as a stencil and dabbed white pigment ink on it for clouds. I decided to add the bench, which I stamped with Stampin' ups Hardwood, and some flower pots from the Spring Garden Die-namic. To finish it I stamped my sentiment in memento tuxedo black. 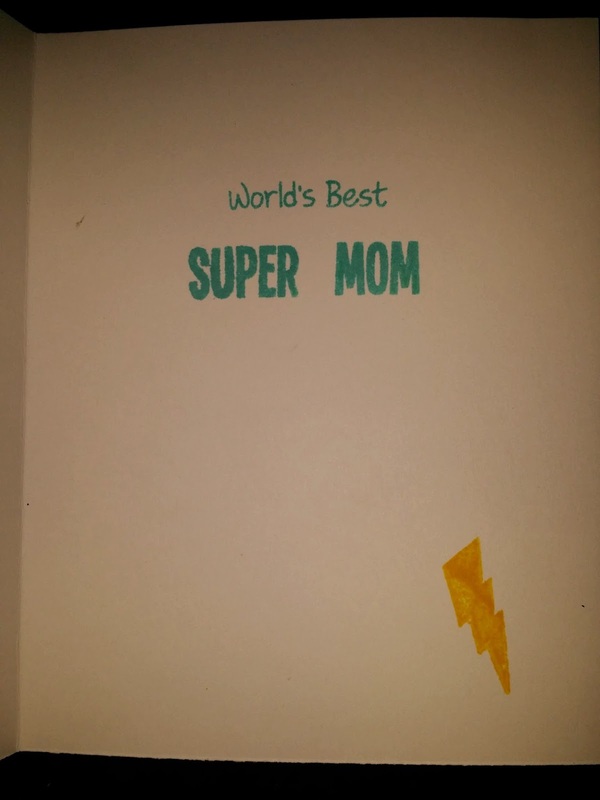 I had a blast creating this card with my mother in mind. 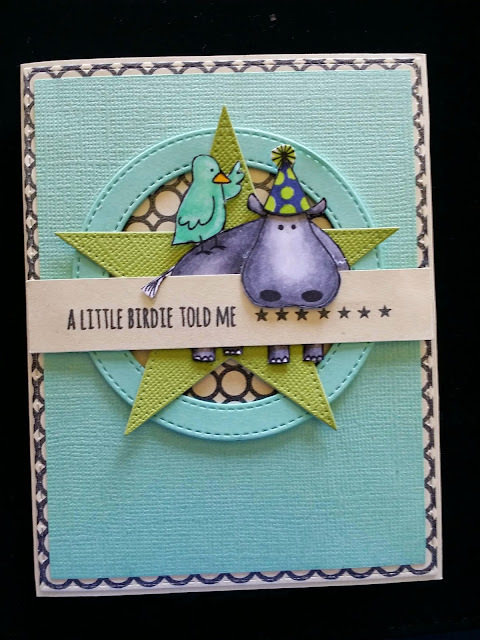 I used MFT Stamps Your Super stamp set and die-namics cloud cover up, blueprints 13, and peekaboo circle window. the ink colors that I used were all my favorite things Dye base inkin the following colors blue raspberry, daffodil, and sour apple. 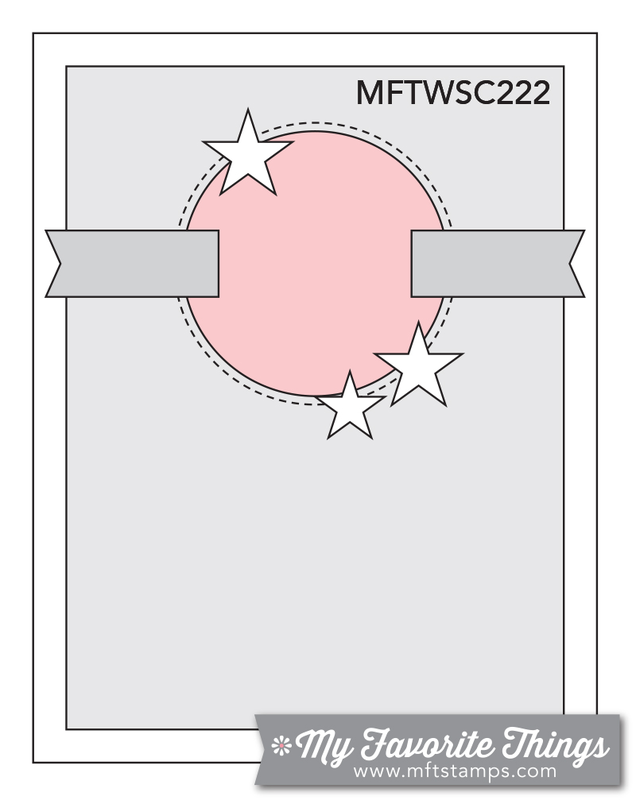 I have been waiting for my MFT You Make My Tail Wag stamp set to come in for a month due to it's popularity. I was ex static when it came in the mail Friday so I immediately went to creating. I started with the MFT Plaid Background Builder and created the background using MFT dye ink Red Hot, Kraft, and Memento Nautical Blue. I used the Memento Nautical Blue to stamp the paw prints on white cardstock. 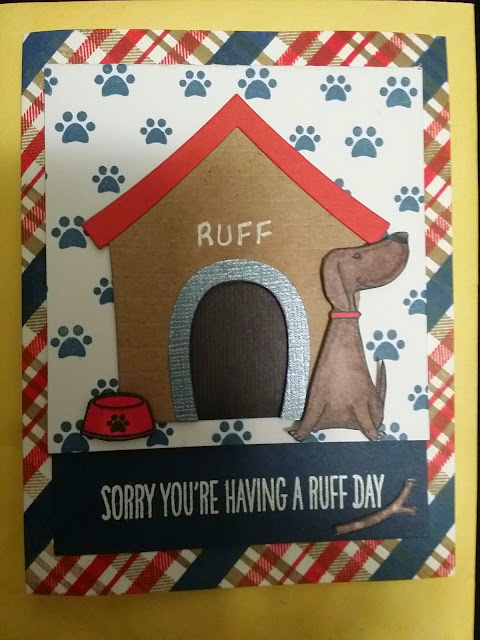 The Die-namics Dog House was cut from red, navy blue, and kraft. I backed it with black to give it some dimension. Copic markers were used to color the dog, bowl, and stick, which are all from the MFT You Make My Tail Wag stamp set. 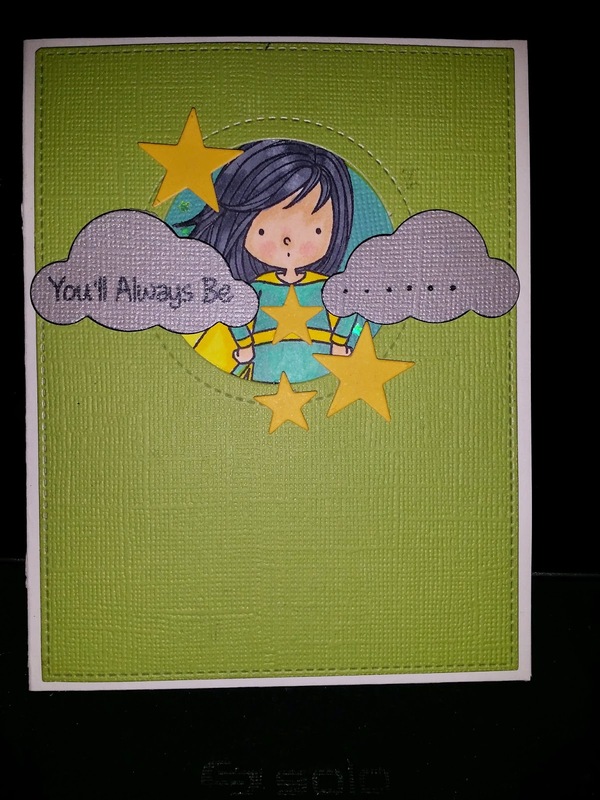 To finish it off I used white embossing powder on navy cardstock for my sentiment. 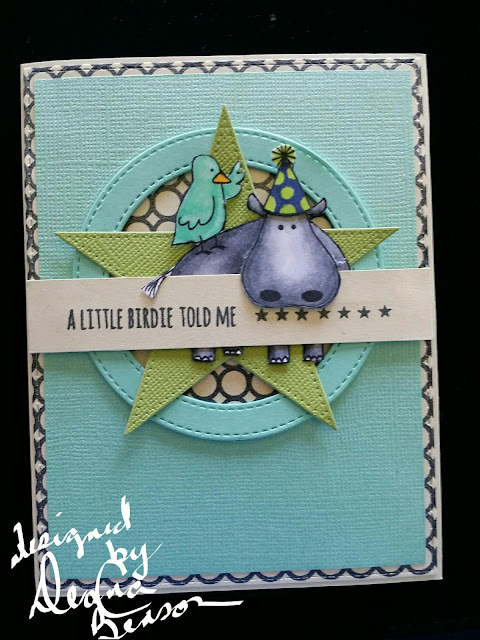 I made this card for the MFT Sketch Challenge and decided to use the color challenge color selection. I started off by stamping the Simply Circles background stamp in Nightshift Blue on cream cardstock and cut it out with the blue prints 15 stitched rectangle. 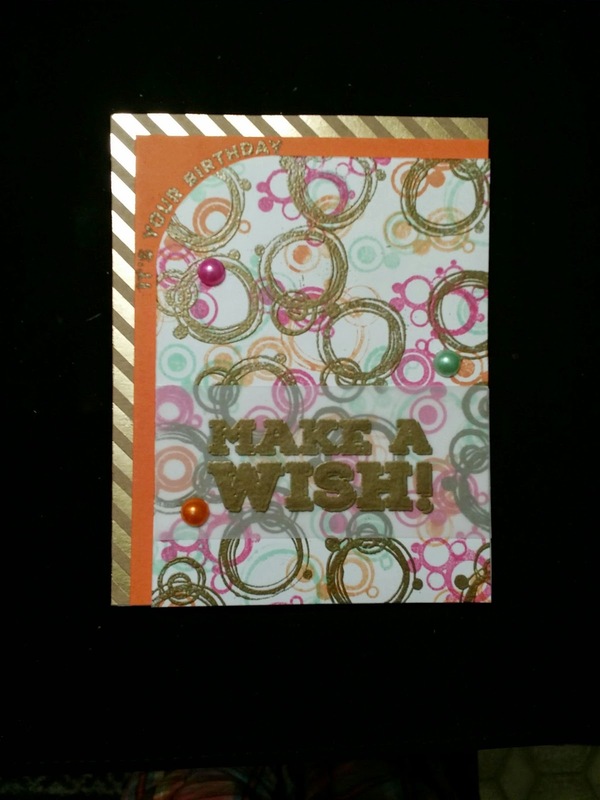 The summer splash was die cut with the Stitched Circle Frame Die-namics. The star was cut from the Pierced Star Stax Die-namics. The sentiment and hippo image are from Ellen Hutson Wish Big by Julie stamp set. I love the cards youthful masculine flair. 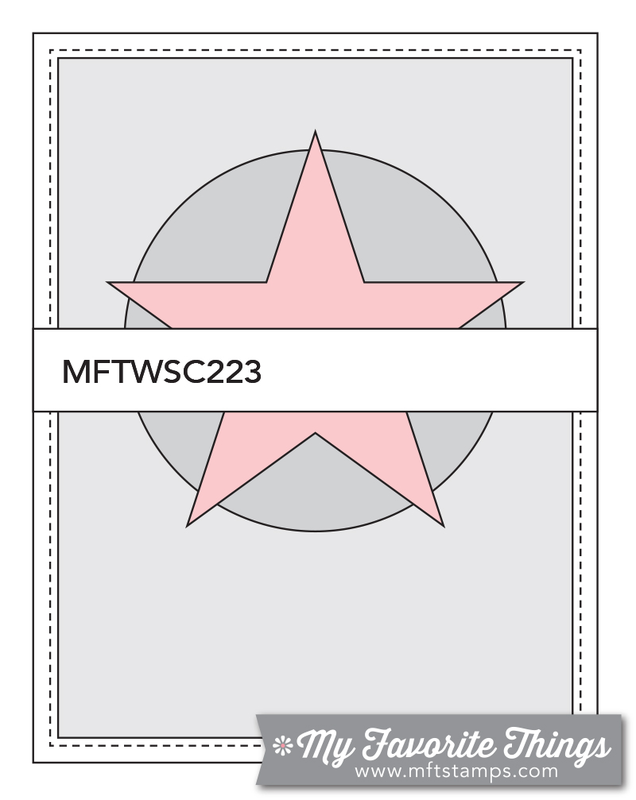 Labels: #ellenhutsonllc, #mftstamps, blueprint 15, die-namics, mft nightshift blue, mft sour apple, mft summer splash, mft whip cream, pierced star stax, stitched circle frame. I had a lot of fun creating this card in between rounds at the race track. I used Ellen Hutsons Bold Blooms and Bold Blossoms by Julie. Color box white pigment ink was stamped on craft cardstock. All other stamping was done using Stampin' Up Soft Suede.